Here it is, and I’m even on time! a blog wherein pictures of fish and information that won’t likely help you will be shared I hope you like it. Last week was another beautiful July week, with a couple of days being roasters, to borrow a lyric from one of my favorite bands “it was so hot outside, you could fry an egg” (bonus points if you know the band) I was opening the pool during one of those mornings and I just about melted into a puddle. Surface water temps are holding steady in the mid 70’s across most of the lake with a few of the shallower bays creeping up even higher, this could be one of the years we see a Tullibee die off from water temps getting so warm, it’s been quite a few years since I’ve seen that happen. Pictured below from L to R: The Giesman family from Clear Lake, IA, Kiley, Jeff and Vanessa, John and Sharon Giesman from Buffalo Center, IA and another of Vanessa with a smile-worthy Pike. With water temps shooting for the stars it has made things a tad difficult for Walleye anglers. Finding Walleye hasn’t really been the issue, cruising around watching your electronics you can find them sitting right on the bottom where they should be, rock bars, reefs, and weed edges, the issue is getting them to bite. This time of year there is really a buffet line of food for most fish, you’ll either need to spend the lion’s share of your day fishing, or hope for a reaction bite or two. Pictured below from L to R: Savanna Osterberg from Poplar Grove, IL with a stringer of Perch and a smile, Bob Osterberg from Belvidere, IL, Kiley Giesman from Clear Lake, IA with a big mama and Carter Mannino from Huntley, IL with his first fish! 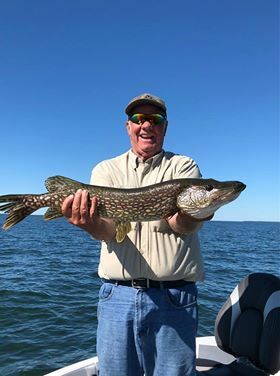 This time of year is usually a crankbait bite for Northern and Walleye with fish seemingly spread across every inch of the lake, being able to fish at around 2mph will help you cover lots of real estate, and more times than not that’s the ticket, try many different spots and hope a fish or two will grab on. The mid-lake reef structure is by far the most popular for your crank-bait-athon, pull out your crawfish and perch colored rapalas and drag them around Submarine Island, Mokey and Flesch’s reefs, heading over to the Snake Pit and West Goose Flats is also a gamble worth taking. Muskie fishing remains the bright spot again this week, they are really most active when the water temps get into the mid 70’s. Tie on small spinners or chopper style top-water baits and rip them fast across the shallow rock structure around Pelican Island, North Bar and Mokey Reef you will be almost guaranteed action, follows have been coming fast and furious and there have been many reports of fish being caught. Hard to believe we’re already have way through our summer season, before you know it the kids will all be heading back to school and the pool will get to take a breather, just don’t say that four letter word that begins with S, I’m not ready for that stuff yet, I’m hoping for a longer than usual fall that we can share with you.